I’ve been a bit slow on the post these days, part of that is because I experienced a life-changing experience some time back, but mostly because I was experimenting with a new medium–youtube! I’ve made 3 new youtube videos, and plan to post one every week. Unfortunately, what that means is that there’s less time to spend on the regular blog post. Hopefully by the end of the year, things will stabilize and I should be able to post a youtube video and a blog post regularly. But for now, most of my effort is going to be focused on the creating those videos. Do you know a Groupon Junkie? It’s those people that start and end everyday checking out what sort of ‘deals’ they can get online, the sort of people who’d buy completely unnecessary items purely because they were on sale. These people literally stalk websites like Groupon or livingsocial to see if they can get a iPhone powerbank for 40% off, or if the Japanese restaurant in Subang Jaya had a deal on Salmon Sashimi. I was a Groupon Junkie once. I used to religiously subscribe to the mailing list of these group discount websites, and what I found was that I was actually spending more than I was saving. Sure I was trying out new places to eat, but in the end I felt I was spending a lot of money on things I never wanted in the first place–and the things that I actually wanted, were never on Groupon. To me, the dream was always if I could get Groupon to pick out the items I actually wanted–rather than a random haphazard items that no one knew existed in the first place. A friend of mine, might have stumbled upon the answer. You see Groupon is a random collection of deals–and the only thing that ties them together is that there’s a deal on them. Visiting Groupon is like windows shopping at the 5 dollar store, sure you might find something useful, but most of the time you just bought yourself a bunch of nonsense just because it was on sale. The only thing in common the items in the 5 dollar store have–is that they’re 5 dollars, other than that they range from cooking to gardening to stationary and even car care. The solution to the problem is to have a specialized website. One that didn’t sell everything under the sun, but a very specific niche offering, so that people don’t feel they’re in a 5 dollar store, but a store that was offering a deal on something they ACTUALLY wanted to buy. But what sort of niche market would that be? What niche market is in high demand–but also would benefit from the concept of group buying. Say it with me now people– THE PROPERTY MARKET! 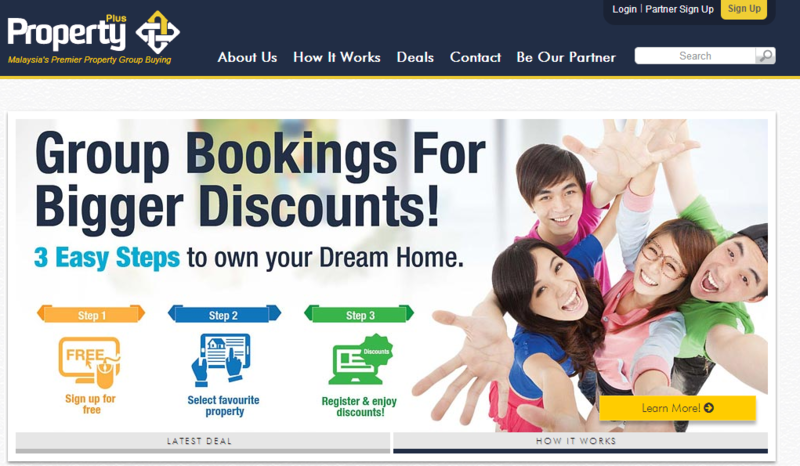 It’s a great idea, because not only are properties in high demand, Property buyers are looking for discounts (after all what buyers aren’t), and from that came the idea of Propertyplus. Why Malaysia should never send anyone into space again–EVER! !